People of a certain age may remember a series of really funny commercials featuring Euell Gibbonsand his famous question about whether you've ever eaten a pine tree. "Some parts are edible" said Euell. Perhaps some parts are, but other pine tree products aren't so nourishing. Perhaps some parts are, but other pine tree products aren't so nourishing. 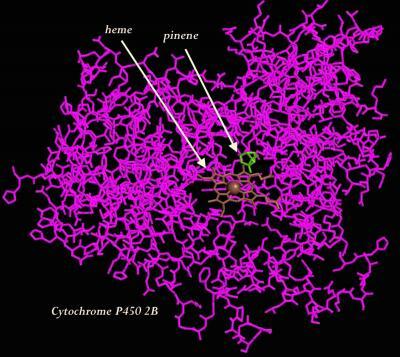 Crystallography365, aka @Crystal_in_cityhad a couple of fun blog posts about pinene, a chemical made by pine trees, that also inhibits cytochrome P450 2B6. I was inspired by their posts and by my experience with Cytochrome P450 to go a little farther. 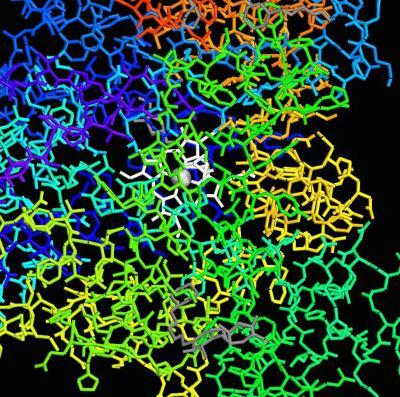 We like to use cytochrome P450 structures in our bioinformatics course at Austin Community College since genetic variations in these enzymes play such an important role in the way that people metabolize drugs and environmental toxins. I thoughtyou might like to see an example of working with this structure and how to make a "cut away" view showingthe active site. 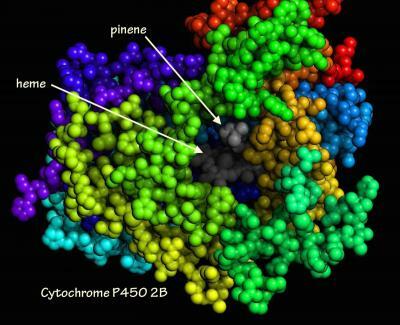 These views are one way of seeinghow pinene binds to the active site and inhibits thisenzyme. CytochromeP4502B shown with molecule coloring. 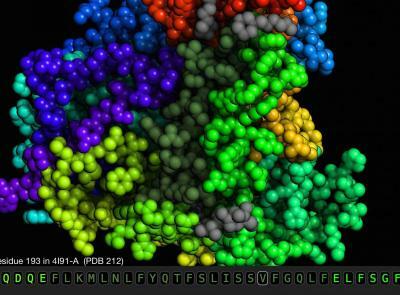 CytochromeP4502B shown with rainbow coloring. Some amino acids were hidden in order to expose the active site. 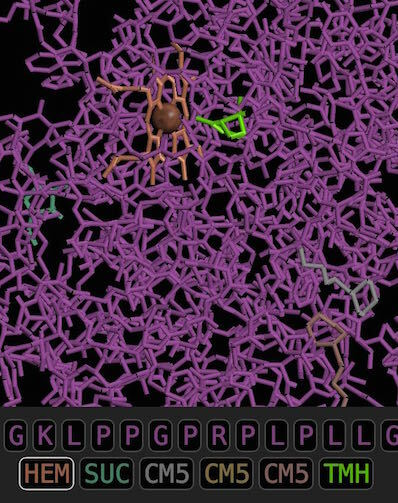 To make these images, I openedMolecule Worldon my iPad and used the PDB ID (4I91) provided by @Crystal_in_city to download the protein structure from the NCBI. I began by opening the sequence viewer,changing the drawing style to tubes, and the coloring style to "Molecule." I knew that HEM stood for heme, and thought the other object (TMH) in center of the protein might be pinene, so I used the colors as a guide and touched the abbreviations in the sequence viewer to the highlight these objects in the structure. It seemed likely that TMH was the same thing as pinene but I wanted to be a little more sure of this. Identifying the chemicals in a structure is one of the hardest challengesfor my students. So, I like to give them examples that show howto find this type of information. I started by looking atthe PDB record for the 4I91 structure to see if they mentioned that alpha pinene might be another name for TMH. The PDB record did give me afull name for TMH, ((+)-3,6,6-TRIMETHYLBICYCLO[3.1.1]HEPT-2-ENE). But, clicking the link from theMMDB record at the NCBI to PubChem gave me a slightly different IUPAC name for the TMH structure,(1S,5R)-4,6,6-trimethylbicyclo[3.1.1]hept-2-ene. Neither recordmentioned pinene except in the article title. I looked in the article describing the structure(1) to see if they mentioned TMH. Nope. Clearly, I needed another strategy. I decided to search PubChem with the name "α-Pinene" and see if that would find TMH. This search gaveme a PubChem record for alpha Pinene with yetanother slightly different IUPAC name,4,6,6-trimethylbicyclo[3.1.1]hept-3-ene. I decided TMH and alpha pinene were probably the same thing, or close enough,since none of the other objects in structure looked anything like the pinene structure. Next, I wanted to make it easier to see where the alpha pinene (aka TMH) bound to the cytochrome C oxidase protein and see heme at the same time, since heme is important for enzyme activity. To do this, I first touched the name of the protein chain to select it, then I applied rainbow coloring so that I could see which part of the protein was in front of the heme and the TMH. 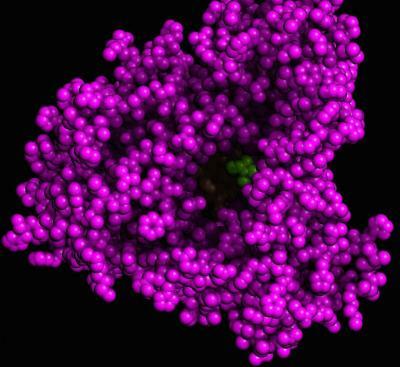 I turned the structure around anddecided to hide the green colored part of the protein. I changed the drawing style to spacefill and started touching greenlettersinthe sequence viewer. 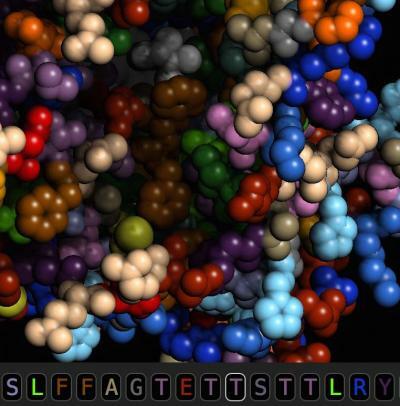 Eachletter represents an amino acid and the same colors are used in thesequence viewer that are used in the structure. Touching a letter in the sequence viewer turns the selection state on or off. If a residue is already selected, then touching the letter makes it dim. If a residue is dimmed, touching a letter selects it. 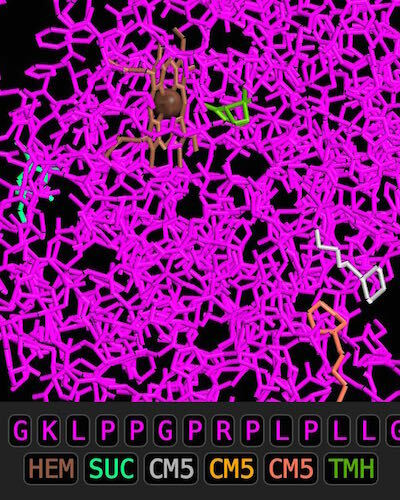 I touched green letters to dimthe amino acids in front of the active site, then, touched "Hide unselected" to hide those residues. I also used residue coloring to help me identify and hide residues in the middle that were blocking my view. And, at the end, we have a view ofpinene nestled all snugand embedded in the active site for the enzyme. 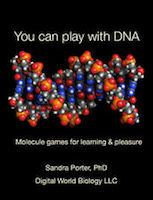 Images: All images were made with the Molecule World iPad app from Digital World Biology.